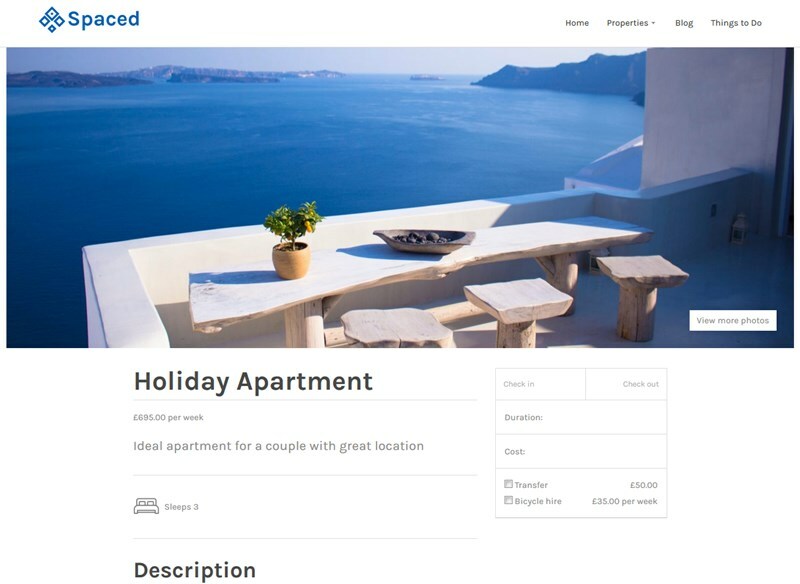 Looking for a reliable WordPress vacation rental theme? Want to start accepting direct accommodation bookings? With WordPress, it’s simpler and cheaper than ever before. We’ll help you look through several trusted, best selling WordPress holiday rental themes as well as less popular, but still very professional solutions. 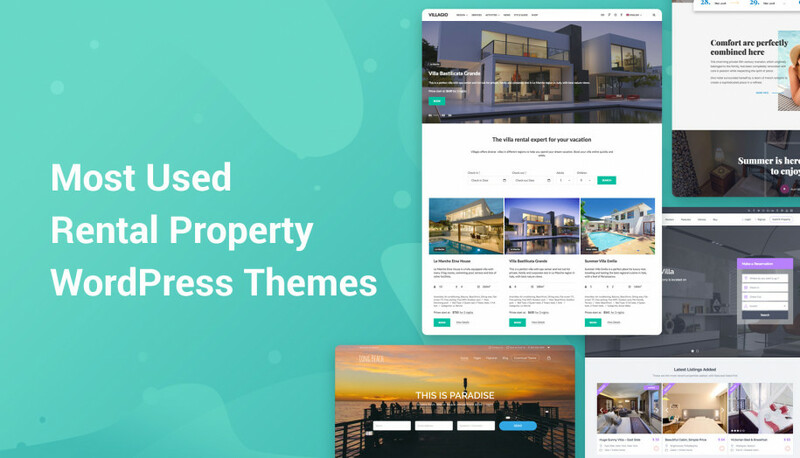 In this hand-picked collection, you’ll find different types of WordPress property rental themes suitable for guest houses, inns, bed and breakfast enterprises, hotels, chalets, you name it. Some themes are real “monsters” – they offer you not just design, but the complete solution for handling your bookings and overall property management, without a need to look for (super expensive!) proprietary reservation software. Others are quite simple – they are also good choices if you need to simply create an attractive properties listing and accept bookings manually – via email or by phone. We’ll elaborate on the details of each theme. Villagio is one of the most used WordPress vacation rental themes for multiple properties in different locations. 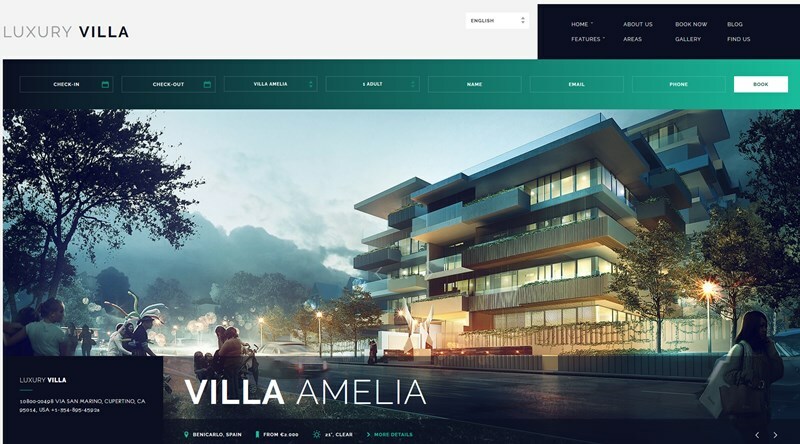 The overall Villagio design is very balanced, with the horizontal real-time search availability form. You can feature multiple properties right on the front page. Villagio is powered by the MotoPress Hotel Booking plugin, which is ultimate in terms of property management and keeping track of all financial and inventory data of your lodging business: properties and facilities listing, rates and seasonal pricing, min and max stay period, selling extras, flexible booking system with the ability to block a property for a certain period of time, taxes and fees info, discount coupons, synchronization with OTAs via iCal and more features. Your guests can pay either a full price or deposit online via PayPal, Stripe, Braintree, or Beanstream/Bambora (plus, WooCommerce Payments addon to integrate more gateways). The guests can also simply leave a booking request if you disable online bookings. The MotoPress Hotel Booking plugin is officially compatible with WPML plugin, which will help you make your website multilingual. You may give a try to a dashboard demo of the Villagio theme, it’s risk free: choose demo #1 (Villas). 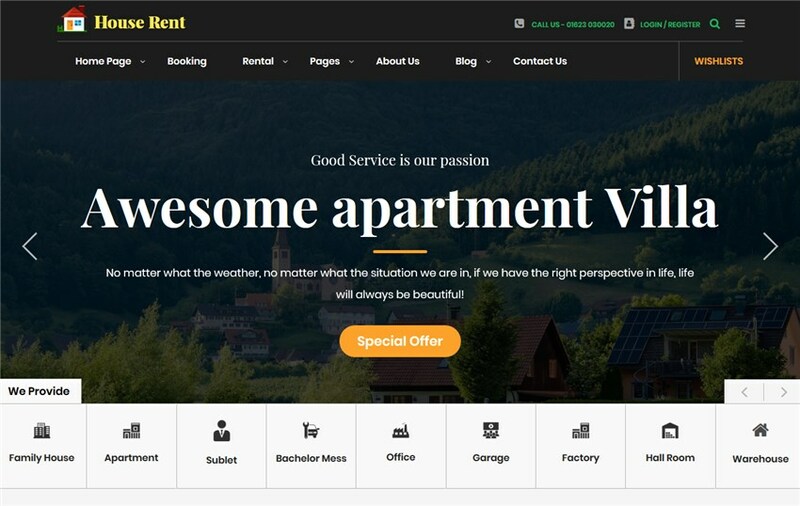 WP Rentals is undoubtedly one of coolest WordPress themes for rental properties. It comes with a crisp design and unlimited options for properties listing and property management. On the front page, you may use either image or video in header. The property booking system is hard coded into the theme, so you won’t be able to use other booking plugins. But if you opt for this theme, you actually won’t need to look for other solutions, it’s pretty powerful to deal with all major operations of the lodging business: different pricing rates, automatic discounts for a longer stay or early birds, minimum length of stay, extra guest pricing, taxes and fees info, deposit payments online, etc. You may also add flexible custom booking rules to individual properties. As for online payments, the theme supports PayPal, Stripe and Wire Transfer (no support for WooCommerce payments). Unlike many other WordPress themes of this type, WP Rentals also allows a straightforward frontend property submission option. The website administrator will be able to assign properties to the property owners. 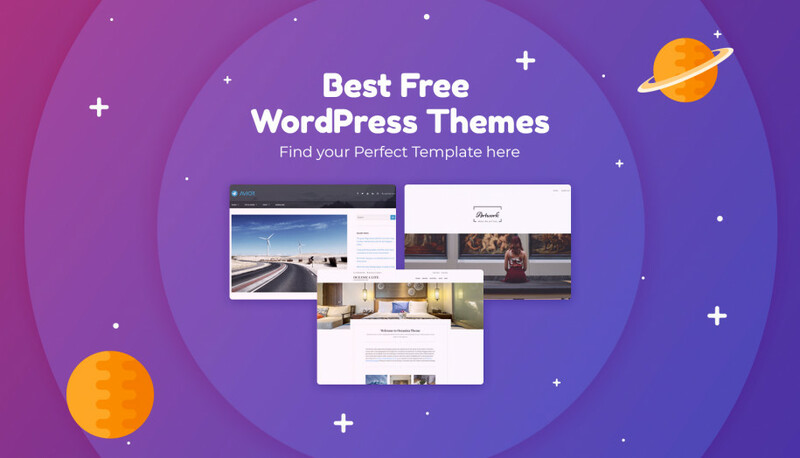 The theme also includes premium WordPress plugins that which may come in handy for editing your website pages: MegaMenu, Revolution Slider and the WPBakery page builder. The theme is also compatible with such top rated WordPress multilingual plugins as WPML and Weglot. 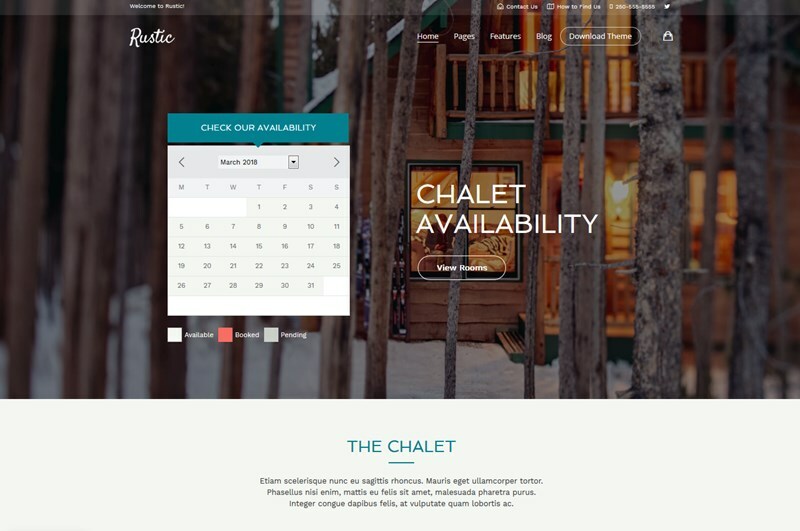 AlpenHouse is a standout vacation rental WordPress theme for different types of resort residences: chalets, guest houses, inns, etc. 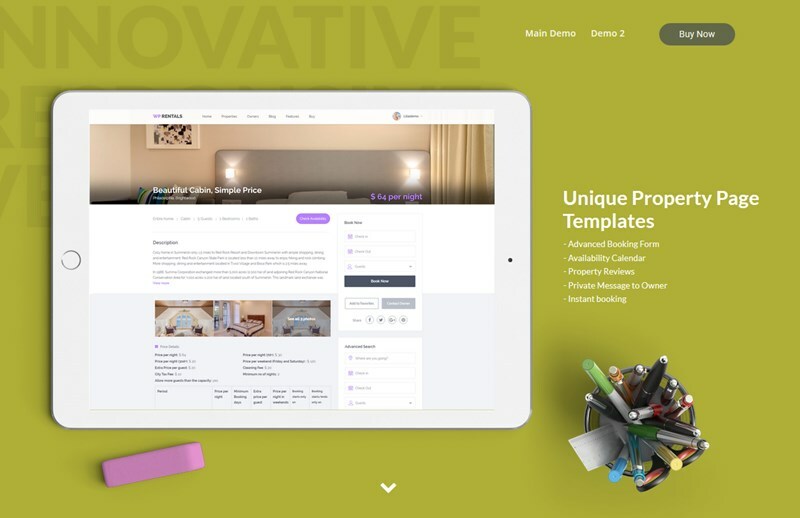 This theme stands out of the pack thanks to three main things: a highly professional design with four front page design alternatives, the mature WordPress booking system for driving direct bookings and 1-click sample data import functionality. It’s in the first place optimized for a ski chalet that can be booked by the room, but you, of course, can tailor it for your vacation rental or hotel. Moreover, you are free to rent out multiple rentals as single items with AlpenHouse, it won’t be a problem from the tech or design perspective. The premium Hotel Booking plugin (which is bundled for free with this theme) will help you add and categorize rentals with all amenities, bed types and the rest of details. This plugin is also responsible for the inventory control, online payment gateways integration, iCal support for syncing your bookings with external travel agents, taxes and fees management, etc. The theme allows to have a different type of header on different pages: you can use a widget like the search availability form, an image, slider or video. The booking form can also be either horizontal or vertical. The pages of AlpenHouse are pre-built in Elementor allowing you to edit them on the frontend with drag and drop visually. 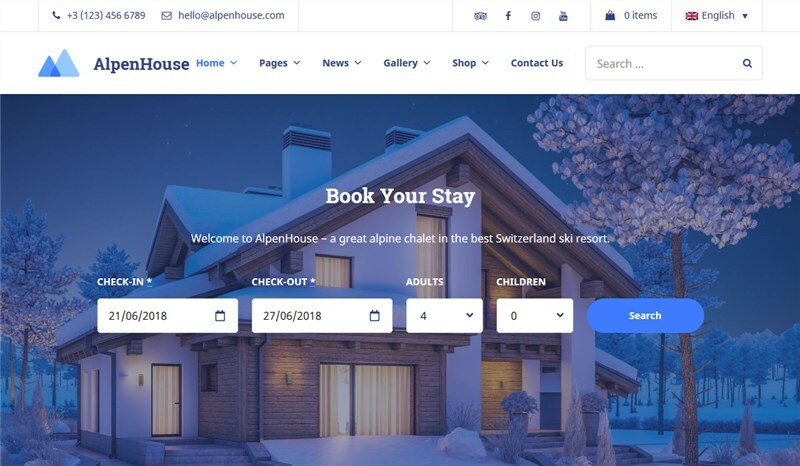 AlpenHouse is a great opportunity to own a modern rental accommodation design, a smart booking engine and a channel manager with a single vacation rental WordPress theme. The Happy Inn is an elegant rental property booking WordPress theme, which is primarily designed for a single property or a hotel with multiple rooms. It comes with a simplified booking process: the guests leave email booking requests and the administrator should confirm them manually. If you don’t want to accept direct website bookings and take all property management operations into your website system, the Happy Inn is a good choice. It will let you simply list the properties, special services, rates or whatever without extra WordPress reservation plugins. The theme design is very smooth and elegant, with the support for MegaMenu, a sticky header, customizable typography, unlimited colors and more. It also includes the Elementor WordPress page builder to help you edit website pages much easier. 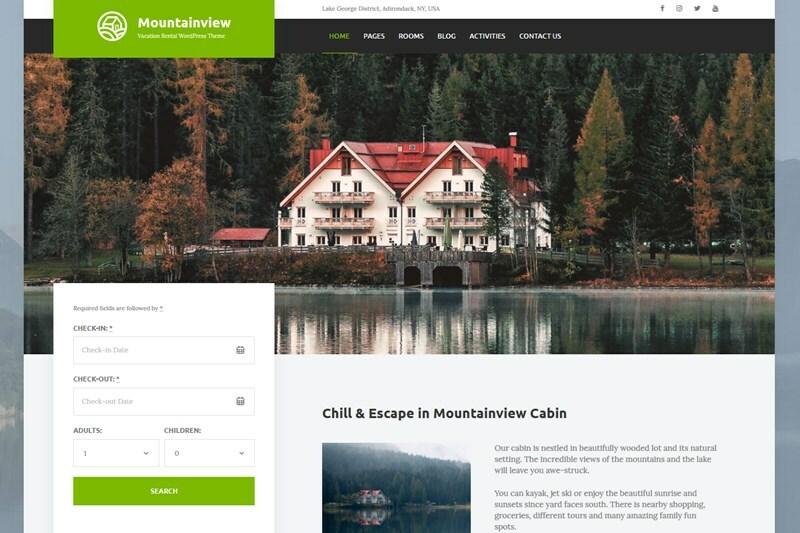 Mountainview is a holiday home WordPress theme with the integrated MotoPress Hotel Booking plugin for online bookings. The theme is perfect for those vacation rental owners who are looking for a simple and powerful theme not bloated with dozens of plugins. You should have happy times working with this theme: import sample data with a single click and customize the theme overnight, add rentals (for a single property or multiple properties) with categorized amenities, services, bed types, etc, enable and set up online payment gateways to receive money for bookings right to your accounts and more. The iCal functionality that comes with the theme out of the box will eliminate the need to look for extra channel managers to sync your bookings with any external travel agencies (the agency must support iCal). The theme comes with several front page alternatives – with or without sidebar, so you can go with either clean minimal website look or use a sidebar with multiple useful widgets. There are also several options for the accommodation types layouts: list with or without sidebar and a grid layout. With this variety of layouts you can set the most optimal view of your rentals depending on their number. Overall, this WordPress vacation rental theme is very elegant and really powerful at the same time. You’ll be able to feature your apartments, guest houses or hotel rooms with a help of a built-in custom property booking system. That is, it’s not standalone – you can’t replace it with any third-party booking plugin. No worries, this system is quite powerful, it comes with almost all necessary functionality to rent out your properties online: seasons and rates, discounts, extra services, fixed check-in and check-out times, an ability to blocks the rooms, summary reports on all bookings, etc. Moreover, it allows to block rooms at particular dates and set automatic consecutive night discounts. iCal synchronization (connecting your hotel to OTAs like AirBnB) is also supported. However it’s limited to just one room of the the same room type (there won’t be a problem if you rent out absolutely different properties). Guests can pay a full or deposit price via PayPal, Stripe, Paymill and Authorize.net. WooCommerce and WPML are supported as well. Luxury Villa is a nice WordPress theme for villas. It comes with a full-screen design, which allows you to feature your villas in details, in a stylish way. However, if you want to change this design, you may choose from 5 homepage alternatives. As for the booking functionality, this theme doesn’t offer an automatic system. Guests will be only able to leave a booking request, each of them should be controlled by the admin. 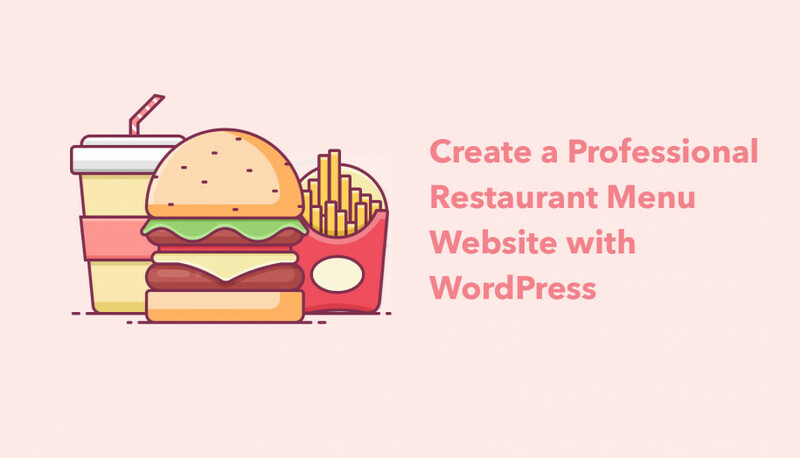 But if one day you decide to implement direct website bookings, you can easily do it with a third-party property rental WordPress plugin like MotoPress Hotel Booking. The Luxury Villa theme comes with a neat property gallery plugin, which lets you display unlimited images of your property. The theme also includes the WPBakery plugin for editing the posts and pages. The typography and the color scheme is also customizable. 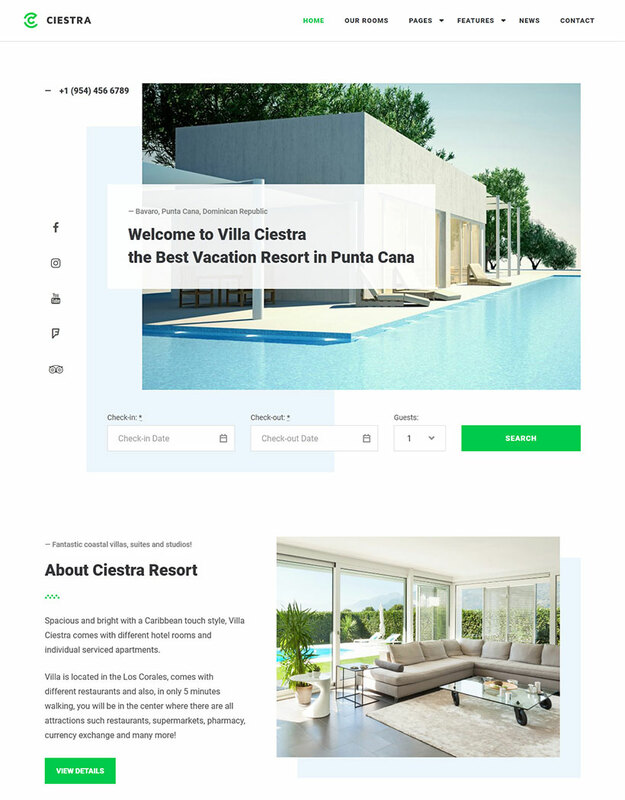 Ciestra WordPress rental property theme is primarily suited for wellness and spa hotels and rental resort accommodations. It features an elegant design with creative gallery layouts for showcasing your properties with all details in the best light. 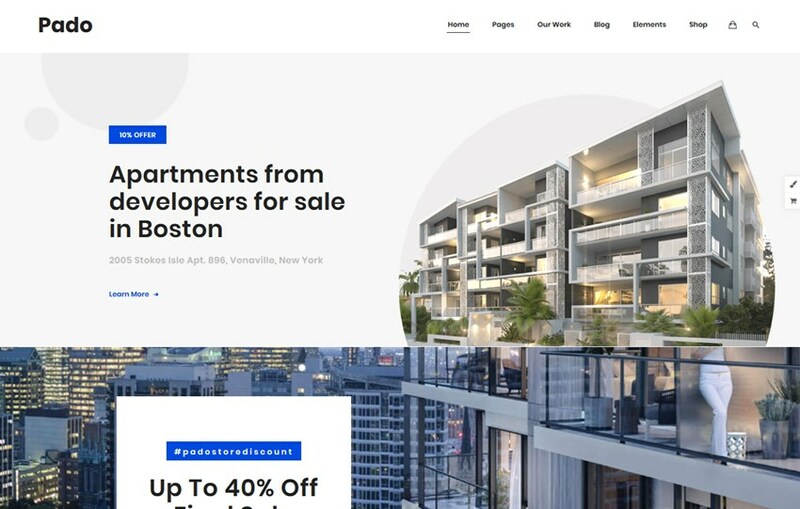 This WordPress website template is a perfect match if you rent out one vacation rental property or a complex condo bookable by a room. The search form you see in the demo, which is implemented with WordPress Booking system by MotoPress, can be altered with no efforts. For instance, you can remove ‘guests’ from the search, add ‘adults’ and/or ‘children’ parameters instead and even add unlimited sorting options like ‘location’ or ‘room type’. The widget functions in real time, so the search and all bookings are made automatically. The booking plugin comes with unlimited powerful features and all of them are available for free within Ciestra. Curious whether it’s a no-brainer in terms of customization? Absolutely. This is actually one of the main advantages of this template. A seamless integration with Elementor visual WordPress Page builder will help you play with layouts and content, reuse custom content modules on any page you want and get the most out of more awesome options (make sure to check out examples of the real-life websites built with Elementor & Hotel Booking). There are also lots of cool monetization plugins like Instagram widget, Testimonials showcase and more in Ciestra. The theme can be installed in one click letting you start editing it really quickly. Bellevue WordPress theme comes with lots of different demos, so you may pick the most suitable one: a hotel, a bed and breakfast, an urban guesthouse, a beach house, etc. Demos come with stunning Parallax effects, sleek professional design and all necessary pre-designed pages for your rental property website. The properties can be displayed in a grid or via custom post types. The theme is powered by a premium version of WP Booking system plugin and WooCommerce for handling secure reservations. Your visitors will be able to see an availability calendar with all available dates and either send a booking request via email or add the booking to the cart and pay for them online. PayPal and check payments are available. The theme supports iCal for managing your bookings via different channel managers. 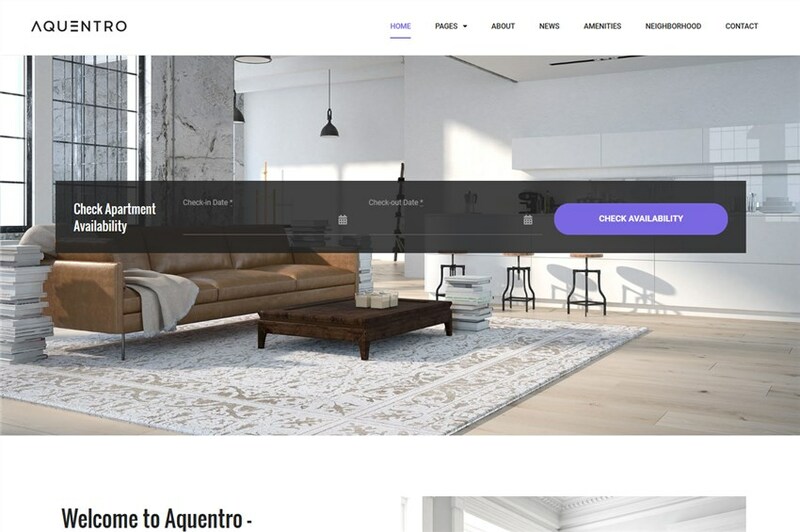 Aquetro single property WordPress theme provides a great example of how to combine an urban, stylish apartment presentation with a solid reservation system that accepts guest bookings automatically. It’s ready to handle check-in and check-out procedures, rates adjustments, online payments via any region-specific gateway, automatic notifications to any number of staff emails and sooo much more. 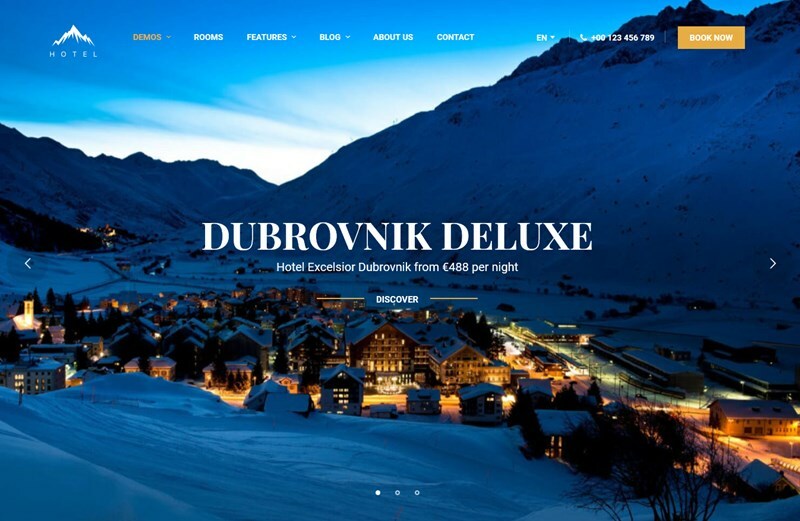 The theme cost also covers the price of the MotoPress Hotel Booking premium plugin ($49 value), which is an industry leading booking engine for the lodging business websites built with WordPress. The theme layouts and structure can be tweaked visually via Elementor page builder, so the theme customization is a real child’s play. Aquentro is not bunched with useless blocks or effects making it really fast-loading and easy to navigate through. The property availability search form is flexible enough to include your custom fields like a number of people, rental type or any other sorting value you may think of. 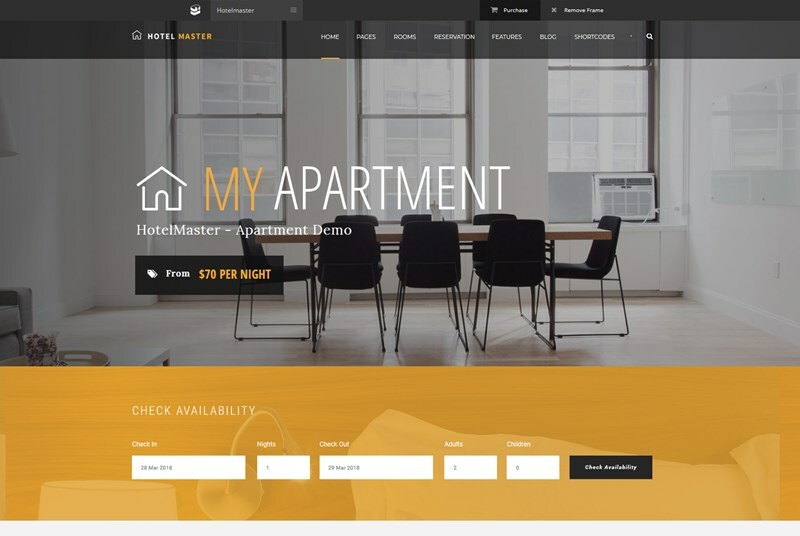 Hotel WP theme is a perfect theme for a property for rent, no matter whether it’s a vacation rental or a small hotel. The theme is a new version of the Sailing Hotel theme, which is one of the best selling WordPress hotel themes. Hotel WP offers a full-blown landing page with multiple galleries to feature your properties, activities, special offers, etc. Colors and skins are also customizable. 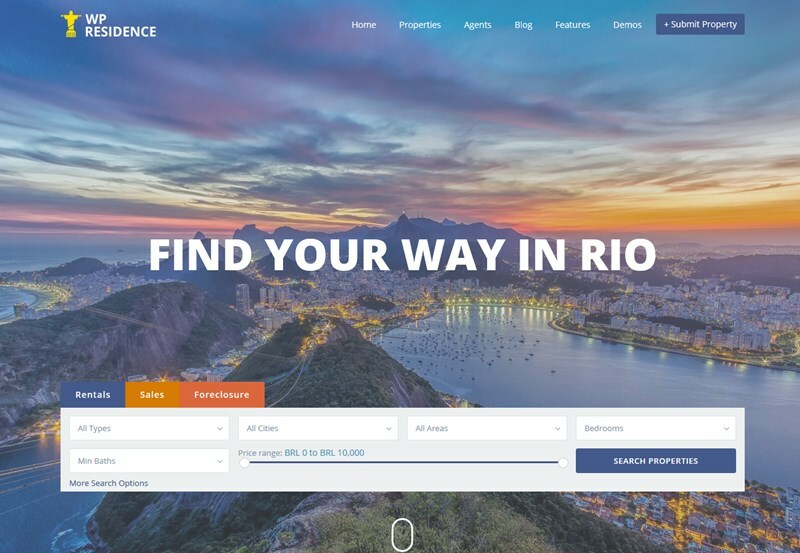 The theme comes with a stylish search availability form that offers the most suitable properties for your guests based on their search parameters. All major key functions for managing your properties are supported: rates and seasons for flexible room pricing, discount coupons, all property facilities, occupancy, PayPal, Stripe and offline payments. You may also integrate WooCommerce to handle booking payments. 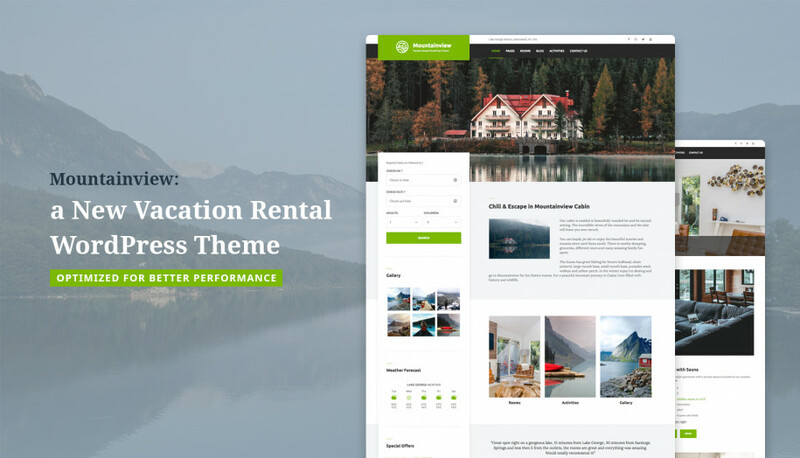 Book Your Travel is a multipurpose WordPress booking theme for hospitality business owners: travel agencies, tour operators, vacation rentals, etc. So, if you need a sort of a mix theme for a property and other sorts of rental, take a look at this theme. Due to the theme complexity, there are tons of options you’ll be able to set up: feature different types of accommodations, display accommodation facilities, adjust guest confirmations, set up an advanced search filtering (including location and star rating), advanced pricing options, and more. You may also feature different tours and enable online booking for them. There are many different settings for each sort of booking. It shouldn’t be a problem to integrate any payment gateway as the theme supports PayPal, Bank transfer, etc. You may use WooCommerce to integrate more payments. The theme is highly customizable on multiple levels: colors, typography, several layout options, integrated premium plugins like Contact Form 7, multiple custom widgets, etc. 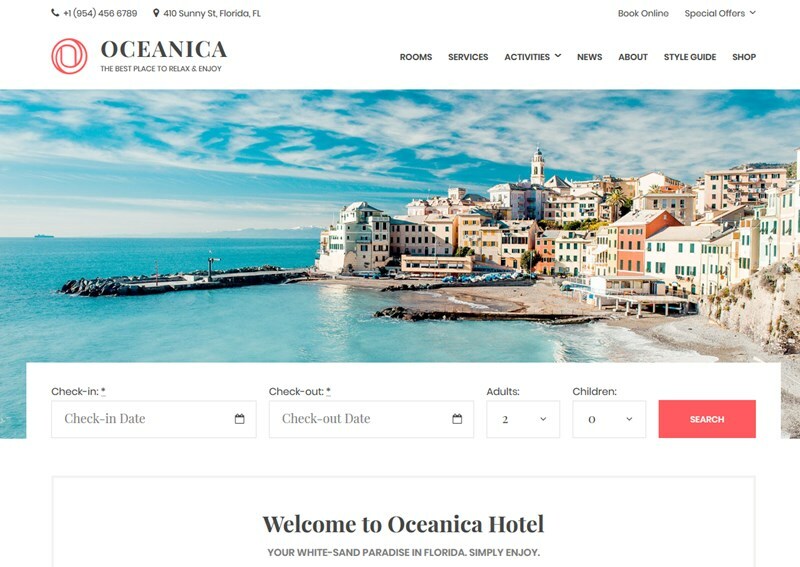 Oceanica WordPress Hotel theme is an elegant and powerful solution for small hotels and vacation rentals. It comes with several layout alternatives (grid and full-width), Jetpack plugin to power your galleries and MotoPress Hotel Booking plugin to handle all the property booking processes. 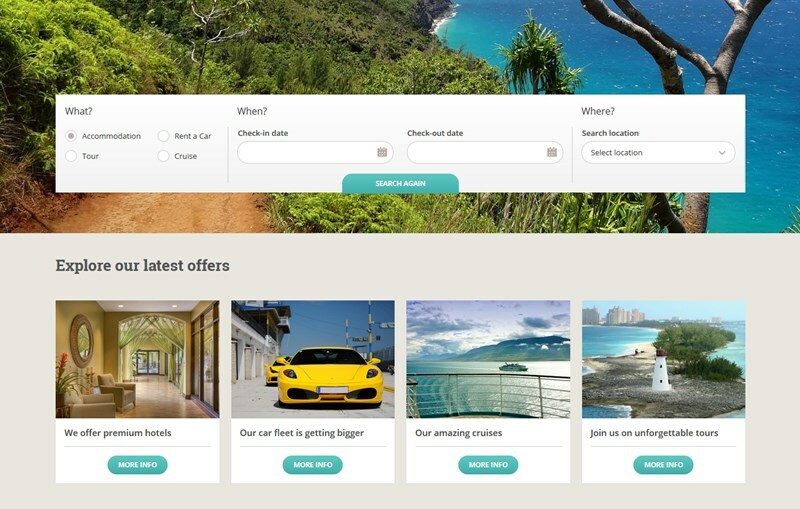 You may allow guests pay online (PayPal, 2Checkout, Stripe, Braintree, Beanstream/Bambora methods are included for free; or use the gateways integrated via WooCommerce) and after arrival, block booking option for a specific accommodation, create discount coupons, let guests book multiple accommodations during one reservation, etc. The plugin also supports complete taxes and fees info, auto sync with OTAs like Booking, and more. All the submitted bookings are automatically stored at the backend, with complete payment history, including taxes and fees. They can be previewed either in a list or in a handy calendar format, so everything can be managed by your staff even without special technical expertise. Admin and customer notifications are sent automatically. The plugin is available in 14 languages and is compatible with WPML. 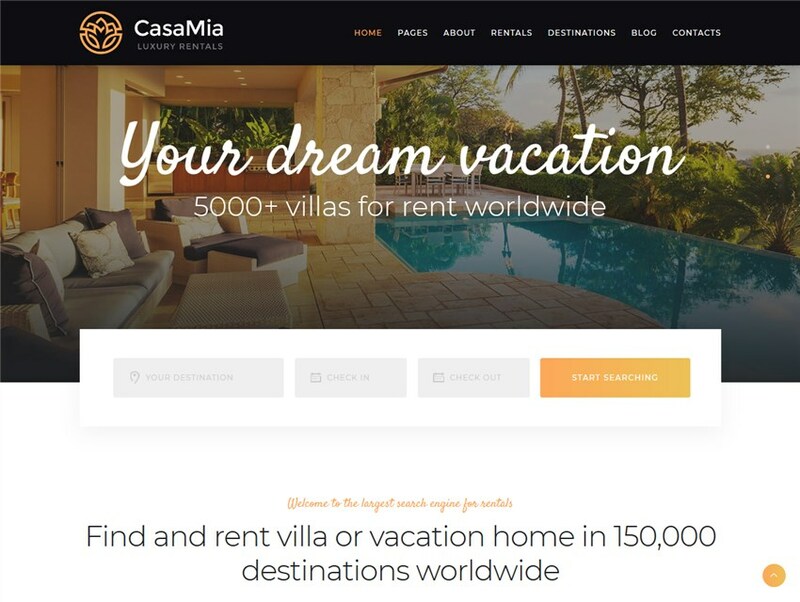 CasaMia enables you to create a directory of rental properties like apartments, villas and other types of holiday retreats. The property listing is built with the Custom Search for Properties – it is in charge of the property search form and enticing individual property pages. If you need to make online sales possible, WooCommerce plugin is fully supported, however, it’s not integrated with the listing of properties. What does that mean? It means you’ll need to implement a third-party booking plugin to accept payments for reservations. The custom theme framework provides you with a robust set of tools to make any theme edits. 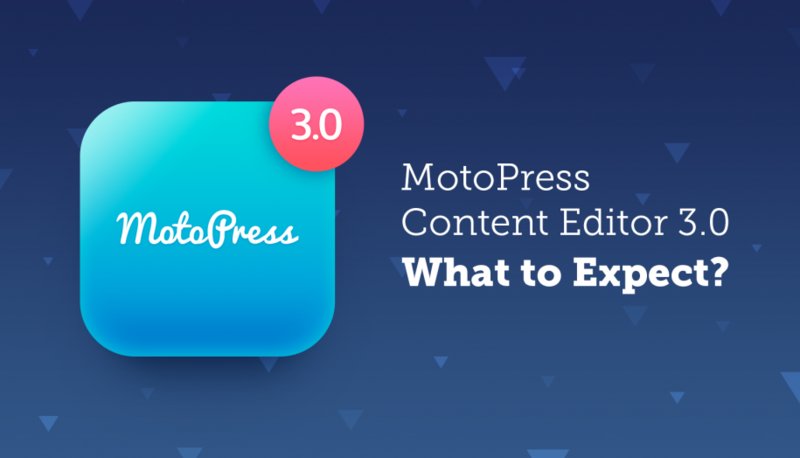 For instance, there are lots of custom widgets and shortcodes to integrate extra functionality, hundreds of Customizer options, advanced blog settings (with support for post animation, by the way) and dozens of other features you might need in the process – and won’t need to search for extra plugins! Several demos versions you can use for building a stunning home page are also there. CasaMia supports full-width and grid layouts; header and footer are customizable via the WPBakery plugin. The theme promises to be compatible with top popular WordPress plugins like Slider Revolution. Elegant and modern, Skyview Complex is one of the best WordPress holiday home templates for a single property, foremost, in terms of design. Despite the fact that Skyview Complex was primarily created for homes for sale, I think it’s not a bad idea to use it for property rental needs, though there is no hands-off booking functionality by default. The property listing related features are powered by the Opal team plugins. It comes packaged with simply mesmerizing, polished demo design solutions that you can make your own website in clicks (thanks to the magic of 1-click demo data import instrument). You’ll enjoy the choice of classic style templates, vertical menus, innovative scrolling, vector icons, perfect visual hierarchy and fancy layouts. Well, you got the idea that I’m impressed with how all design trends are implemented in this theme. Theme adjustments should be smooth thanks to the built-in King Composer plugin, so you can easily get a needed theme makeover. As of writing this, Pado is the newest citizen in the industry of lodging business WordPress themes. Nevertheless, it gained a huge popularity (read: 17 sales) on its release day, which immediately led to receiving a ‘’trending’’ badge on the ThemeForest marketplace. And for a good reason. It offers a choice of 14 innovative, impressive front page designs, 74 built-in section templates for any purpose you can mix and match, a collection of pre-designed wow-effect boosting elements like slider, stats widget and others. 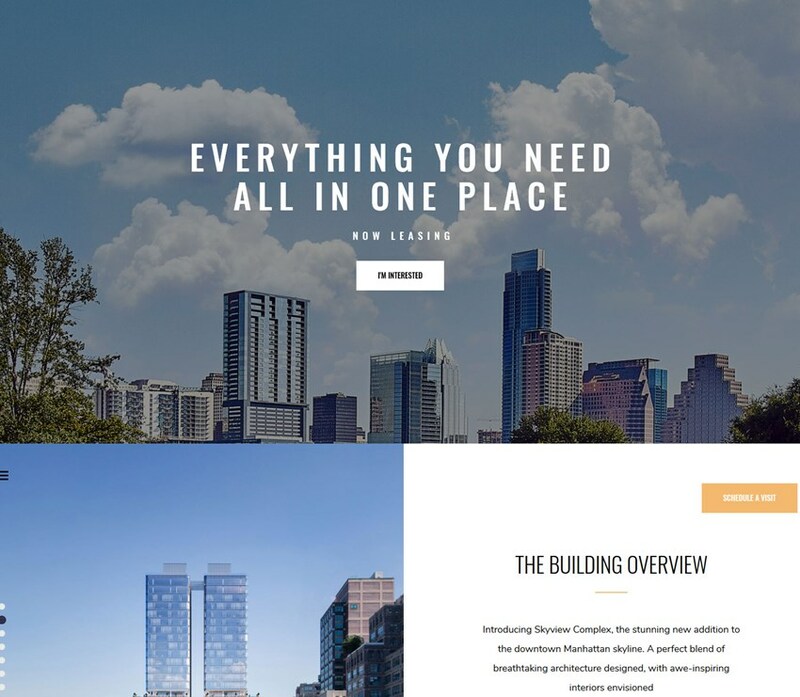 You can also employ ready-to-use header styles, a diversity of concept portfolios for a single property and tons of modern looks you may turn on with widgets and plugins. A smooth integration with the top-industry eCommerce plugin, WooCommerce, is also offered. All that means Pado can be a perfect match for any type of vacation rental home. 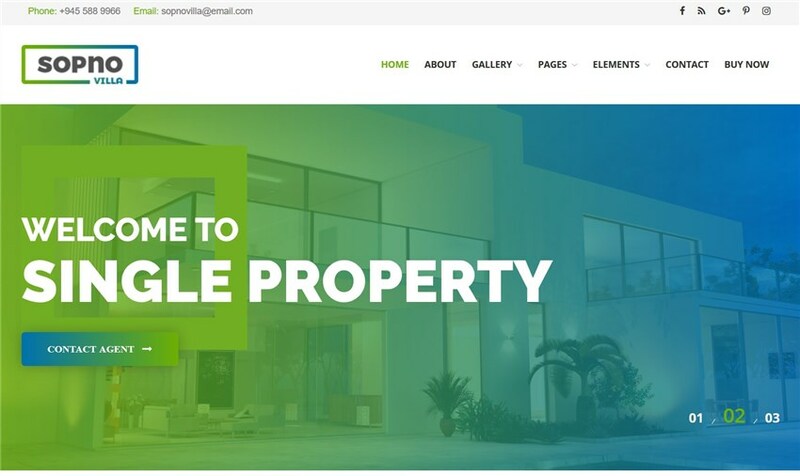 The only downside of this theme is that it lacks a robust property booking functionality that could operate out of the box, which so far makes this theme a good solution for property presentation needs only. HouseRent is a great solution for renting out any type of property – offices, apartments, garages, school spaces, etc. Since the rental unit search form is fully customizable, you can include any custom fields to provide customers with a great user experience. The reservations should be handled via email (your guests will find a simple ‘request booking form’ along with each property details). From the design standpoint, you are spoiled for choice – there are tons of villa and rental home designs you can install without any hassle. If you need to alter colors and typography, change header style or add any extra piece of functionality, HouseRent got you covered. Sopnovilla is rather a classic theme for a single property. Since it’s created with a layers builder, you can make your tweaks without any specific tech skills. It’s well suited for presenting a house you need to sell or rent out. Dozens of useful WordPress widgets integrated for free will help you design the template the way you want. For example, you may play with the typefaces, integrate dynamic content, employ the MegaMenu plugin to rebuild the website navigation structure and more goodies. UrbanPoint is a nice solution for a directory of properties. It comes with a great property search form integrated with the Google Maps. The property information can be presented in a stylish, bold way, with all essential information in the spotlight. Guests can book a property via an integrated contact form and leave a review. Using the Redux Framework the theme is powered by, you can give a special look to any theme part, including footer, header and blog. Such premium plugins as WPBakery plugin and Slider Revolution are packed for free! Overall, UrbanPoint is suitable for both rental properties by homeowners and small real estate portals. 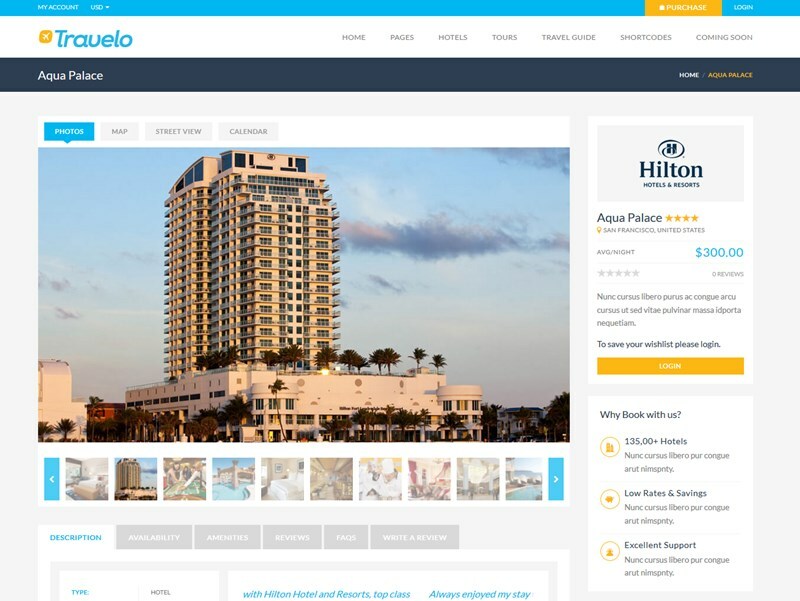 Travelo is a tour and hotel booking WordPress theme. It features a modern responsive design and is perfect for booking a hotel room and optionally a tour. It’s a pretty dynamic and well-balanced theme with awesome galleries, a homepage slider, 10 site skins, 8 header styles, 6 footer skins, a sticky menu and all sorts of inner pages to create a professional look of your lodging business website. Travelo is powered by a booking system that is integrated with WooCommerce, which lets you easily keep track of all reservations. It comes with a pretty user-friendly interface for simple and quick bookings: your guests can check the availability, amenities, reviews, custom policies, etc. The theme also comes with a login user area allowing property owners to manage their accommodations. There are also several premium WordPress plugins included for free: The WPBakery plugin, Revolution Slider and the Layer Slider. Spaced is a great WordPress property rental theme with a lightweight uncluttered design. 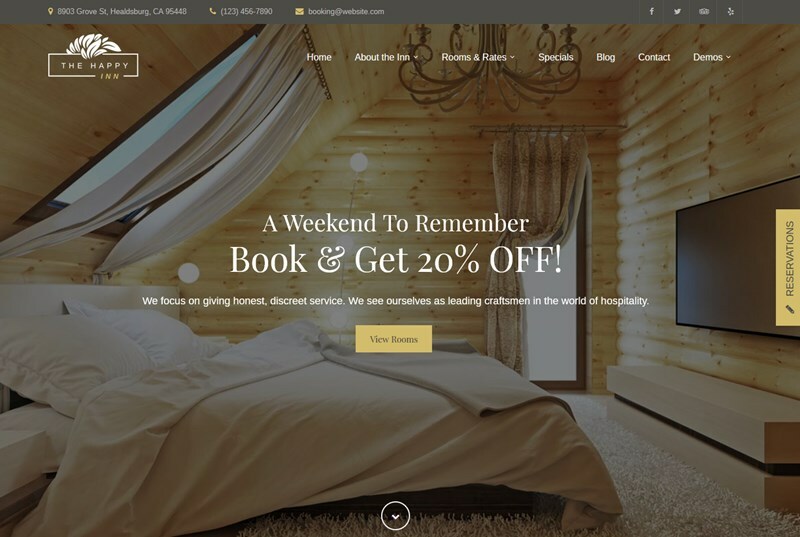 It slightly resembles a highly intuitive Airbnb design, so if you need to present a few of vacation rentals and rent them out online, this theme can be even more handy than any other promoted theme with tons of crazy bells and whistles. Using the Spaced theme, you may build your properties listing and optionally enable direct website bookings via the integrated WooCommerce Bookings plugin. It lets you feature the properties with all amenities and essential info like the max occupancy and size. Guests can add extra services to the reservation, pay online via WooCommerce gateways and leave a review. Spaced is a really awesome theme with a great performance and a professional booking functionality. 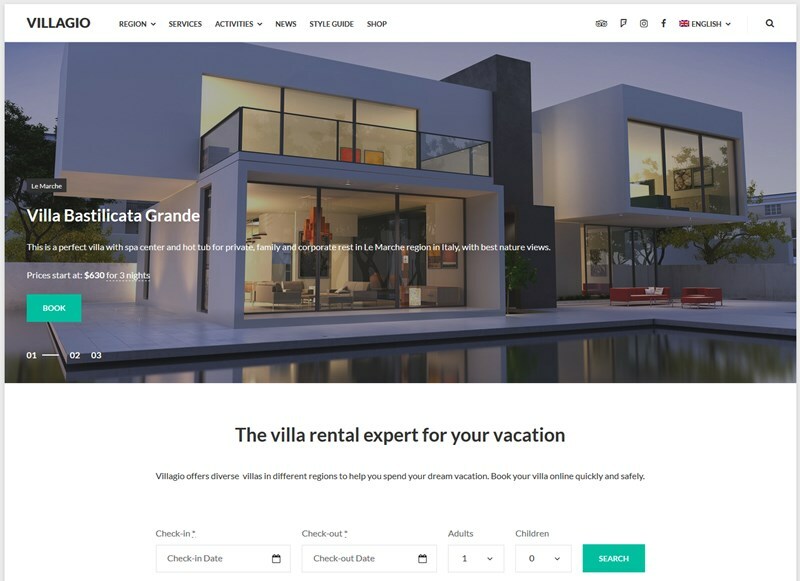 Villa Rental is a popular property booking WordPress theme that is powered by the Templatic property reservation plugin. Using this theme, you can add and customize unlimited accommodations for rent, each with their own pricing, details and a booking calendar. The property management system is flexible enough to let you add different room rates, taxes and fees, minimum stay info, list extra bookable services, create discount coupons and more. You are free to use full-width or grid layouts for your website pages, customize the main color scheme, set up a header slider, etc. Your guests can pay online via a variety of the integrated payment gateways: PayPal is free and other gateways like Stripe or 2Checkout are available as paid addons. The theme is compatible with WPML, WooCommerce, Contact form 7 and other popular WordPress plugins. 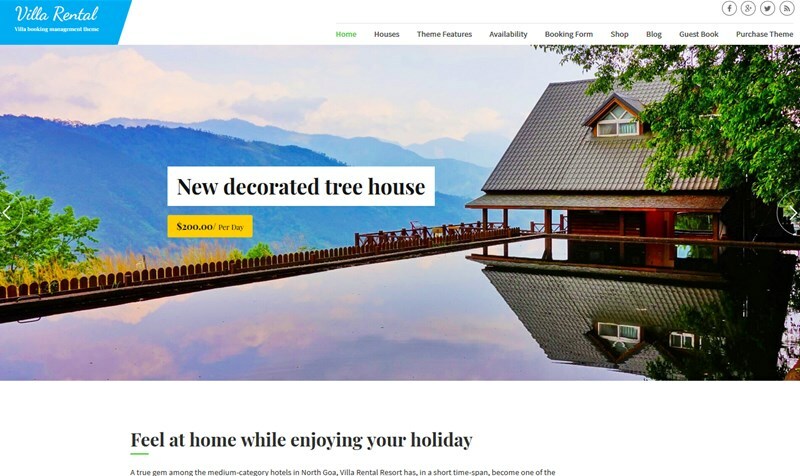 Overall, I’m sure Villa Rental is quite neat and flexible WordPress holiday rental and B&B theme, with just the right bunch of options, without excessive features. Residence is a great theme for real estate agencies as well as property owners. It comes with 12 demos with different look and feel, so you are spoiled for choice. It lets you create a website where the property owners can submit their rentals right on the frontend. 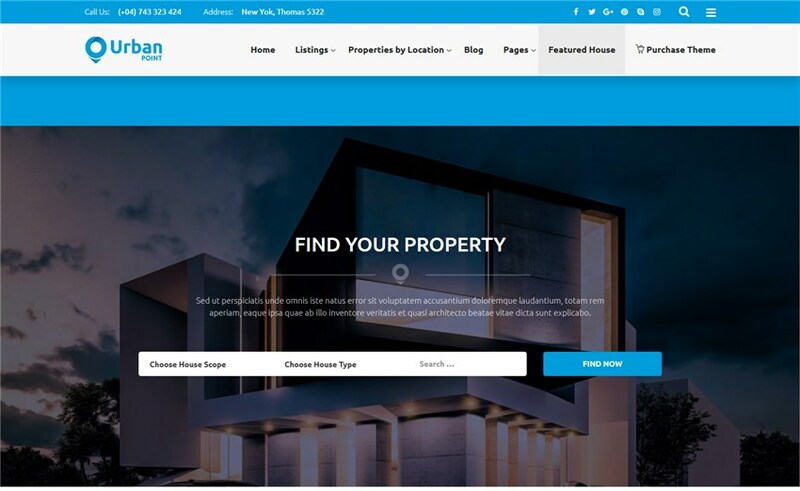 It comes with dozens property page layout alternatives so you can create a really stunning and unique real estate website. You should really take a look at all the features to make up your mind whether this is really your theme. There are different payment gateways you can enable to accept online payments, including PayPal and Stripe. Disclosure: this page contains external affiliate links and we may be paid commission if you buy products featured above. The thoughts on this page are our own and have not been based on the payment. all of these templates are working with the Motopress Booking plugin? WOW, Nice collection of Vacation Rental WordPress Themes. I was looking for a Vacation Rental Theme for my client. Thanks.